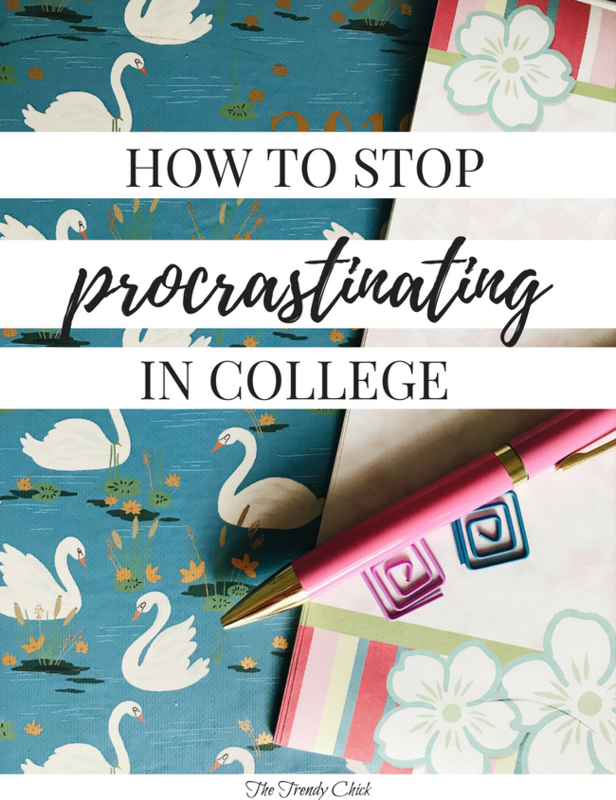 After making it through 3 years of college, I feel like I have learned my fair share about how to not procrastinate and how to stay on top of things from the beginning of the semester. For some back story, I have never really been a big procrastinator. If I have big assignments hanging over my head it is hard for me to go out and have fun when I know I should be working on that. Even in high school I was pretty good about not procrastinating. But freshman year of college it was a little difficult for me to balance everything as I transitioned into college, and I procrastinated more than ever that first semester. Luckily since then I have realized that I save myself so much stress if I keep procrastinating to a minimum. At the beginning of the semester, I take all my syllabi and write everything into my planner. This helps me know from the beginning when my busy weeks will be and plan around those. If I see that I have 3 papers due in one week, I know that I will want to have at least two of them finished before I even start that week or else I will be drowning. I also know some people who like to make a big spreadsheet of every single task for the semester, so that is another option! Every Sunday I take a few minutes to plan out the upcoming week. I want to make sure I am aware of all assignments, big and small. I also usually try to get any readings I will have to do throughout the week done the weekend before to free up a little extra time during the week. In addition to school stuff, I also make sure I have at least one or two things with friends scheduled in to give me something to look forward to! I also plan out any gym time and roughly plan my meals for the week. Obviously I don’t stick to my schedule exactly, and I don’t plan out every minute. But if I know what I need to get done each day to get through the week, and have a little time to myself scheduled in each day, it makes it go a a lot better! You know those things that you put off that actually end up being really quick and painless? Get those done when you think of them! Walking by your dishwasher on your way to get food? Take the few minutes to unload it. Have a short assignment that sounds really boring but in reality won’t take long? Just conquer it! In my Audiology class we had reading responses that we had to do for every chapter. I would try to get 2-3 of them done at a time when I did them because once I was in that mindset I was able to do them pretty fast and then they weren’t hanging over my head later because I dreaded them. This can apply to a lot of smaller tasks or busy work like that! This is especially important if you only have a class once or twice a week! I have found that if I tell myself I have to finish homework for my classes the day it is assigned, then I always have it done by the time the next class comes around and never have the chance to accidentally forget. This doesn’t apply to larger projects and papers, but if it just a short response to something, do it the day you get it! One major thing I had to adjust to in college was the fact that you get almost all of your papers and projects assigned at the beginning of the semester and it is up to you to get everything done by the final due date. To be honest, my type A self loves this because I can plan out my whole semester at the beginning pretty much and set my own deadlines so I have everything done in advance. One trick I use is setting smaller deadlines for projects, such as having all my sources by X and having a rough draft by X. I also try to set a final due date for myself about a week before the project is actually due so if I have something come up I have a little wiggle room. I know I have shared this so many times, but my number one tip for productivity is having a running to-do list. I am a visual person and seeing all my tasks written down keeps me moving. I try to make a to-do list the night before or in the morning, so when I get back from classes/clinic I am able to see what needs to be done and start tackling things. If I don’t have a to-do list, I generally waste a lot more time trying to think of things to do or avoiding a big project while I could’ve been tackling the smaller things I needed to do! How do you keep yourself from procrastinating? Let me know in the comments!